Dean Canto maintained his perfect record in 2017 Supercheap Auto Bathurst 1000 co-driver sessions, topping Practice 4. 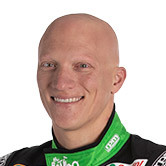 Canto, teaming up with Mark Winterbottom, was fastest in the co-driver running on Thursday and turned a lap of 2:05.3368s after the chequered flag to beat James Golding by just 0.0088 seconds. In cool conditions, Prodrive Racing Australia filled the top three places entering the final 20 minutes, with Canto leading Richie Stanaway and Steve Owen. Canto had been the first co-driver to dip below the 2:06s barrier this weekend, with a 2:05.9647s, but Mobil 1 HSV Racing's Warren Luff lowered the benchmark by half-a-second with his 2:05.4848s. Luff’s time was still the one to beat when drivers headed back out after the second and final red flag period, to retrieve Taz Douglas’ spun Lucas Dumbrell Motorsport Commodore from Murray’s Corner. The session ultimately went green again with three minutes remaining but Luff stayed in pitlane, with drivers only going to get a single flying lap. That, though, was enough for change at the top. Paul Dumbrell vaulted up the order from 17th to what was eventually fourth and Golding took top spot from 13th with a 2:05.3456s. The Garry Rogers Motorsport driver’s time at the top was fleeting, with Canto edging back ahead to continue Prodrive’s promising start to the weekend. “They made gains in that session which was good,” said Winterbottom. “He put tyres on at the end and a pretty good fuel load and had a crack. “I think there was a bit left in it across the top as well, so it’s a solid result. Garth Tander noted that his co-driver Golding “hadn’t even done a ‘six’ before today”, while Luff, Dumbrell and Owen completed the top five. Dumbrell had offs at the Chase and Murray’s Corner earlier in the session, while Triple Eight stablemates Steven Richards and Matt Campbell were 13th and 16th. 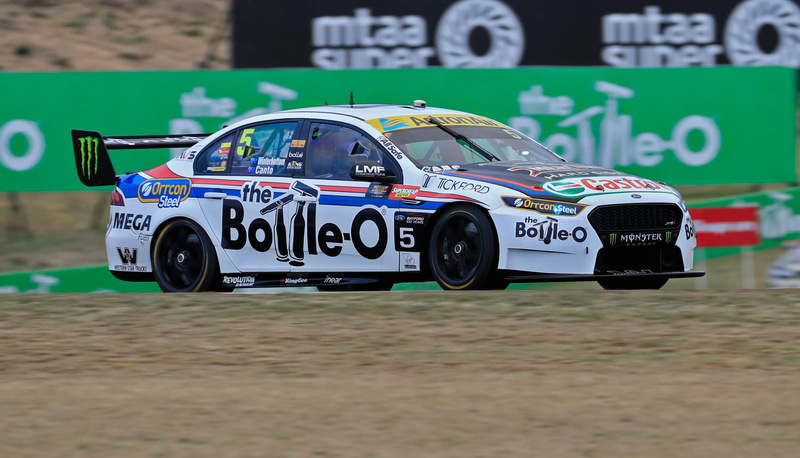 Dunlop Super2 racer Todd Hazelwood was an impressive sixth for Brad Jones Racing and Stanaway made it three Prodrive Falcons inside the top seven. Stanaway’s Falcon had a suspected airbox fire that shut the engine down when he engaged the pitlane speed limiter during the first red flag period, called 21 minutes in when Chris Pither ran wide and got beached at The Chase. The fourth Prodrive entry was 18th, with Garry Jacobson missing the late shootout due to an electrical problem. Shell V-Power Racing pair Tony D’Alberto and Alex Premat and Brad Jones Racing's Macauley Jones completed the top 10, while David Russell was the best of the Nissans in 12th. Luke Youlden looked set to vault to the top end of the order in the final 10 minutes in the Erebus Commodore that set the pace on Thursday with David Reynolds. However the Douglas-induced red flag curtailed the lap and left Youlden in 21st place, one spot ahead of Pither. 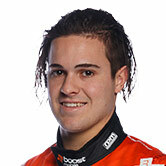 Andre Heimgartner joined Brad Jones Racing as Tim Slade’s co-driver, replacing the injured Ash Walsh. The Freightliner Commodore was repaired overnight following Slade’s Practice 1 crash, Heimgartner turning 22 laps on his way to 24th place.